2009 24'' x 72'', Diptych. Materials: Oil, acrylic and iron oxide onto canvas. 2009 24'' x 90'', Diptych. Materials: Oil, acrylic and iron oxide onto canvas. 2009 48'' x 72'', Triptych. Materials: Oil, acrylic and iron oxide onto canvas. 2009 24'' x 72'' Materials: Oil, acrylic and iron oxide onto canvas. After a long bout of homelessness this man was hospitalized for schizophrenia. He found the love of his life at that hospital, a fellow patient. They now live together happily while helping each other. We tried a few outfits, but this one felt natural while inappropriate. He told me that he wanted to hold a piece of paper stating “I’m looking for anybody”. That too felt right. 2009 24'' x 90'' Materials: Oil, acrylic and iron oxide onto canvas. 2009 24'' x 72'' Diptych. Materials: Oil, acrylic and iron oxide onto canvas. 2009 48'' x 72'', Tetraptych. Materials: Oil, acrylic & iron oxide onto canvas. 2009 48'' x 72'', Triptych, Materials: Oil, acrylic and iron oxide onto canvas. Carol of ‘Just Because’ hair salon told me she was sponsoring high school graduates at the top of their class, doing their hair and nails and getting other businesses to sponsor them too. I asked her if the girls would want to manifest that moment with their kicks, curlers and prom dresses for an exhibit titled “Inappropriately Dressed”. The girls said yes. 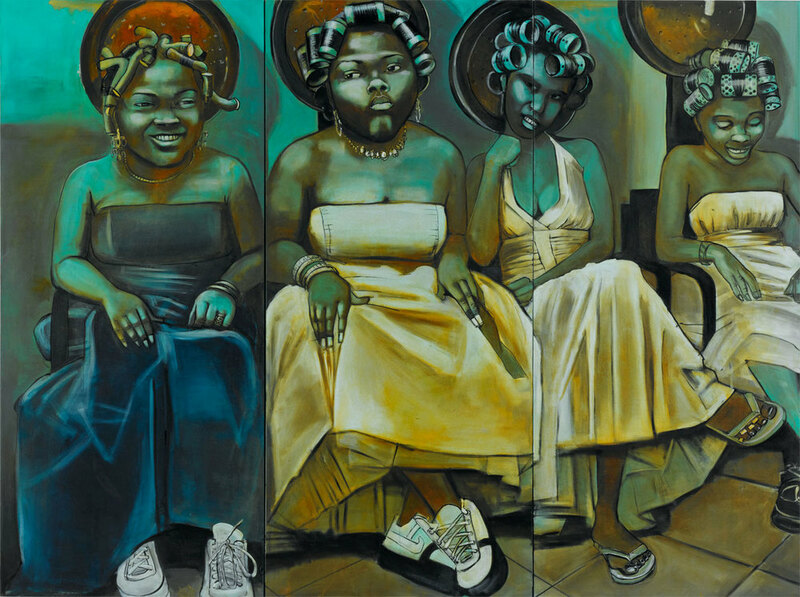 It became a portrait of four prom girls not quite women, but certainly not just girls anymore.